The latest release on Kunai Records welcomes Michael & Levan and Stiven Rivic back to the label with a brand new single. The Kunai bosses are fresh off remixes for Asymmetric Recordings and Balkan Connection in the month of June. They capped off a successful first half of the year which also showcased a collaborative project with Quivver and a single on Cid Inc’s Replug Records. Now as the second half of 2016 begins we see Michael & Levan and Stiven Rivic presenting one of their most anticipated singles to date alongside remixes from Petar Dundov and C-Jay. As the sound of trio constantly evolves, each Michael & Levan and Stiven Rivic production comes with much excitement. Once thought of as purely progressive house artists, Michael, Levan and Stiven have become adept at stylistically varied creations. 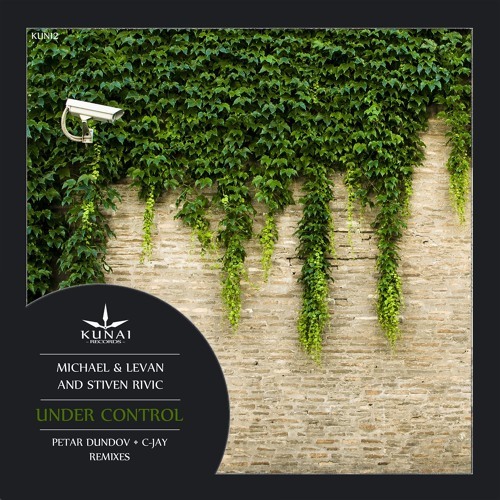 On ‘Under Control’ we find them returning to their roots and crafting a classic slice of deep, driving progressive house. As mounds of bass roll forward, soft stabs and ethereal vocal pads accent the framework carrying the track into the main break. Here the atmospheric themes tantalise the senses while a trail of metallic keys add that extra bit of emotion. A rush of sonic dust brings the groove back like a warm, reflective wave as all the elements converge for a tastefully, emotive conclusion. The first interpretation of ‘Under Control’ is provided by Petar Dundov who is making his first appearance on Kunai Records. The Croatian artist is one of the most storied techno producers of the last 20 years, Petar’s music stretches sonic boundaries like almost no other. His inimitable style is marked with timeless qualities and has long been a favourite of DJs like John Digweed, Laurent Garnier and Sven Vath. His interpretation of ‘Under Control’ has been much anticipated and takes the track into more hypnotic territory. Backed by a beefy techno-minded groove it begins with a mesmerising pulse. The main motifs from the break gets utilised to full potential here with waves of meditative metallic’s and ethereal sonics flowing through the framework. A brilliant interpretation from Petar and one you’ll likely be hearing a lot in the coming months. The second and final interpretation of ‘Under Control’ is provided by C-Jay who is also making his first appearance on Kunai Records. The Dutch producer and Sessions label boss has been a fixture of the electronic underground for well over ten years. Appearances on classic progressive house imprints such as Cyber Records and Vapour Recordings solidified C-Jay‘s place amongst the progressive techno elite early on in his career. Highlighting his discography though is a recent ambient LP for John Digweed’s Bedrock Records. Here C-Jay continues with the same ambient vibe which made his Bedrock album so great. Beginning with glacial pads and subterranean growls it’s delicate melodic story builds with chilling emotions. Broken beats combined with time stretched hypnotics and shimmering overlays make for a chilling peak, rounding the release out with feelings of both isolation and hope. A gorgeous interpretation from C-Jay and another excellent offering from Kunai Records full of variety and talent. Don’t miss it.